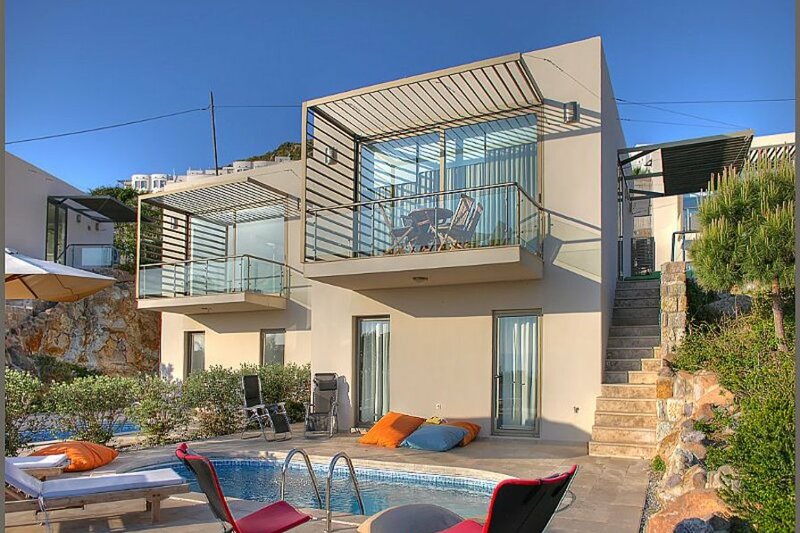 Aegean Hills, an award winning complex that offers a boutique Aegean experience with a stunning 3 bedroom, 2 bathroom luxury duplex villa and private pool. The villa is equipped with a modern kitchen with stone worktops and natural limestone floors throughout. The villa also offers free wi-fi, air conditioning throughout the unit , cable TV/DVD including international news, sports and movie channels and a home theater system. At first floor level a large living and dining area leads onto the spacious balconies. The villa also benefits from floor to ceiling windows that provide superb sea and garden views. At ground floor level there is a master bedroom with an en suite bathroom , and two additional bedrooms (twin) with a family bathroom. All bedrooms allow access to the terrace and private pool area. The fully fitted kitchen comes with all necessary utensils and cookware. Furthermore the kitchen also includes a breakfast bar, hob and oven, a fridge/freezer, microwave, washing machine and dishwasher. The quote given is inclusive with hot water, private pool maintenance fee, cleaning of the villa once a week (for bookings that are at least two weeks or longer). There are no extra costs for cleaning after your departure. The electric fee is 6 GBP per day which will be added to your balance to be paid upon reservation. The minimum stay for this villa is one week in July and August, we offer 24 hour check-in and check-out. A welcome pack is also available at an additional cost which will be stocked in your villa for your arrival. We offer boutique concierge service prior , during and after your stay. Some of enhancements can be private airport transfers, car hire, daily boat tours, turkish bath, scuba diving, and wind surfing. Feel free to ask the helpful and experienced staff if you have other requests. We will be very happy to make your stay as pleasurable and leave you with great memories. There is also a complimentary golf buggy and driver available to transfer guests between the car park and the villas. In addition there is a free private shuttle bus for Aegean Hills guests that runs to the local supermarkets, beaches and to Bodrum town centre. In addition to the fully specified villa the complex has superb mediterranean gardens including mature olive and lemon trees, abundantly flowering oleander, lavender and rosemary. A large infinity swimming pool with ample terracing and sun loungers is situated in the middle of the complex and below this there is a children’s pool suitable for very young children. For the more active there is a tennis and basketball court. For any queries or requests there is a reception office which is manned during the day that allows for easy booking of taxis and boat excursions or to simply borrow tennis rackets. Within a short drive there are many places to visit. The picturesque town of Yalikavak is just 5 minutes away and boasts a brand new international marina, a number of high quality beach clubs, restaurants to suit all tastes and a weekly market that sells everything from local cheeses, vegetables and fruit to jeans and sweatshirts. You can hire a large Turkish sailing boat and leave from Yalikavak to visit the secluded bays and enjoy snorkelling in the crystal clear waters or you can drive the other way and enjoy the quaint fishing village of Gumusluk that offers the chance to eat freshly caught fish in the many seaside restaurants. The village also has sailing clubs and an excellent beach club. Just a kilometre away is a wonderful restaurant called ZeytinAlti which is infamous for its breakfasts. You can enjoy a full Turkish breakfast, drink freshly orange squeezed juice or tuck in to wonderful scrambled eggs cooked Turkish style. It’s well worth a visit and has a wonderful sea view from its terrace. And it’s cheap too! There are too many places to mention but a visit to Bodrum is worthwhile just to see the large sailing boats, enjoy a coffee at the marina or to take advantage of the huge array of shops.